Jason Naismith is facing a fitness test ahead of the match against Southend. Peterborough United have the perfect opportunity tomorrow (March 23) to start one final push for a League One play-off place. An out-of-form, understrength Southend side are the visitors to the ABAX Stadium (3pm kick-off) and a win would move Posh back into the top six if Doncaster lose at League One leaders Luton and Coventry City fail to win at home to Oxford. Siriki Dembele is back in the Posh squad for the match against Southend. 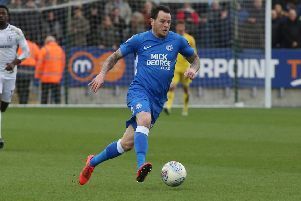 Posh welcome winger Siriki Dembele and centre-back Ryan Tafazolli to their squad, while defenders Jason Naismith and Rhys Bennett are expected to shake off knocks. It’s likely Lee Tomlin will be restored to the starting line-up as Ferguson seeks that elusive winning formula. Posh have lost their last three League One matches to leave their hopes of a top six finish dangling by a thread. 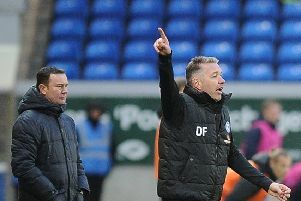 “Consistency of selection has been difficult because we’ve been struggling for results for a while now,” Ferguson stated. “The players are a fairly quiet, fairly young bunch and some are lacking on confidence which has been obvious by their performances. “But it’s a great opportunity to right the wrongs of the previous week when we managed to lose three games in a row. “It won’t be easy, nothing ever is, but we’ve worked on the mental side of things a lot this week to try and make sure we react better to any setbacks we get in a game. Southend will be without full-back Jason Demetriuo who is on international duty with Cyprus as well as winger Stephen McLoughlin who has picked up an injury. The Shrimpers are outside the relegation zone only on goal difference after a run of 10 League One matches. Manager Chris Powell received the dreaded vote of confidence after a 1-0 home defeat by AFC Wimbledon last weekend. “I have to lead from the front, put my shoulders back and take everything on the chin but that’s fine,” Powell stated. “I want this club to be better and push on. We have to find a way to do that in these eight games. “This is the first of eight cup finals for us. We’re in a position no-one wants to be in but from 12th down we’re all in it and it’s not as though we’re cut adrift.